Mayor Thomas M. Menino, awash in affection and a sense of his place in history, climbed to the stage Thursday at ­Faneuil Hall to confirm he would not seek a sixth term, illness having robbed him of the vigor necessary to be the kind of mayor he needed to be. No longer, he said, did he possess the stamina to be the tireless neighborhood champion who for two decades drew his energy from the politics of ribbon cuttings, school plays, and chance meetings with residents. The announcement ends the reign of a former insurance salesman who backed ­into the mayor’s office, only to become one of the most powerful figures in Boston history. Addressing a crowd that ­included the governor and a senator, City Hall secretaries and union electricians, ­Menino struggled to check his emotions as he spoke about love. Those three words — “I will leave” — capped years of speculation about how long one man could run a major American city. It immediately set ­into motion a political drama not seen for a generation. 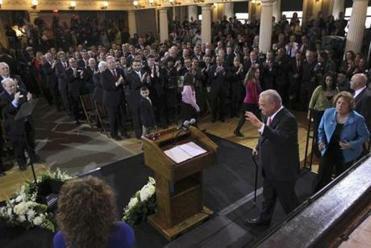 Standing on a stage with his wife, grown children, and grandchildren, Menino gripped the podium and bit his lower lip as he scanned the crowd. They were all there: his devoted staff at City Hall; his former aides who have risen to hold their own elective offices; developers who have reshaped the city; foot soldiers from his five election campaigns; and clergy who have given him counsel and walked the beat with police officers on Boston’s most troubled streets. Menino and his wife, Angela, received a standing ovation as they took the podium as Faneuil Hall Thursday to announce his decision. In the front rows sat city councilors and other elected officials sure to join the growing field of candidates who will spend the next seven-plus months fighting to succeed the mayor. The 70-year-old mayor seemed determined to get through the three-page speech without succumbing to his emotions. After an initial ovation that lasted more than three minutes, Menino quieted the crowd with his arms and then bucked himself up for the task ahead. “You made it harder even than it is going to be,” he said. The mayor had walked gingerly down the aisle at Faneuil Hall, evidence of his sapped strength after a protracted hospital stay and a three-month convalescence in a city-owned mansion that ended only last weekend when he ­returned home to Readville. News that Menino would not run for reelection reverberated across Boston and ­beyond. The goodbye had begun in the morning at City Hall, where a wakelike atmosphere enveloped the hulking, concrete building he has inhabited since first winning a seat on the City Council in 1983. Menino started in his fifth-floor office early in the day. His suit coat off, Menino wore a crisp white shirt and orange tie. He sat in his usual seat, not behind a desk, but at the head of a mahogany conference table, with Faneuil Hall and the Custom House Tower looming outside a floor-to-ceiling window. At one point, Menino’s 13-year-old granddaughter stood in front of him and broke down crying. Menino pulled her in close for a hug. The staff came in waves, filing in and out of his office like a receiving line. First, he spoke with his closest aides who work within shouting distance of the mayor’s office. The next wave included Cabinet chiefs and other top officials, such as Police Commissioner Edward F. Davis and Daphne Griffin, the city’s head of human services, who reached down and gave Menino a hug while he sat in his chair. They gave him a standing ovation, and Menino ­remained seated, his head down, his chin resting his hands. Staff members clutched tissues and some walked quickly out of Menino’s office, tears streaming down their checks. The grief marked an era’s end, but there was also a great sense of pride for what had been accomplished in the last 20 years. In his speech at Faneuil Hall, Menino explored the ­data point that may bring him the greatest satisfaction of all: Polls routinely found 50 percent of city residents said they had met the mayor. He used it as a motif to ­recount his accomplishments and routines in his two ­decades in office. He met people as they rallied with gay friends and neighbors, Menino said, and as they opened their arms to immigrants, standing with them when they became citizens. He said he met people on cold winter nights as they conducted the city’s annual homeless census, when they stood up to say the downtrodden ­also count. Menino met people, he said, when he stood with new homeowners in public housing and told them they deserved a yard and a front door. He met people, Menino said, reading to children in new libraries in Mattapan and Brighton. The speech was supposed to end there, but Menino wanted to make clear this was not the end. He will remain in office until his fifth term ends early next year. So he did something that has given his half-dozen press secretaries indigestion since 1993: He went off script. “We could have some real fun,” Menino said. After the speech, the crowed spilled outside as dark clouds gathered and rain pattered on the cobblestones. Current and former Menino aides mingled, sharing stories, and laughing loudly. Nearby, the bright glare from television equipment stood out against the dark sky. Several city councilors stood eagerly in the light, waiting for their time on camera. Stephanie Ebbert and Suzanne Kreiter of the Globe staff and Globe correspondent Matt ­Rocheleau contributed to this report. Andrew Ryan can be reached at acryan@globe.com. Follow him on Twitter at @globeandrewryan.